We found 726 results matching your criteria. Three layer, breathable fabric; provides protection from the elements and air borne pollution. Purposely designed not to trap dirt and dust particles and reduces interior temperatures up to 50 degrees. Originally designed for Discovery I. Once converted, you can select many aftermarket wiper blades to fit. 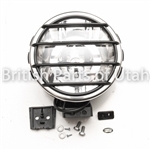 Britsh Parts of Utah offers a brand new product for relocating the spare tyre on the carrier on the rear of the Discovery I and II. The relocator works by slightly shifting the spare wheel up (by about 1 1/2") to clear the rear bumper, enabling the fitment of larger tyres. The Kit comes with all the hardware you need for one of two install options. The first install would be a bolt-on method (no cutting required). The second install requires you to cut the factory wheel studs on the carrier (this is the recommended install). The product is machined from 1" 6061-T6 Aluminum plate and then black anodized for looks. Your Discovery (SD) does not have fog lamp in front bumper? Feel missing something? The conversion is a cinch using Land Rover Genuine spoiler mount fog lamp kit. Kit comes with complete installation manual, fog lamps, switch, harness and brackets. Other color trays are shown for reference. Other colors are discontinued and no longer available. compatible with cargo rubber mats and loadspace liner.